Northern California offers many scenic spots and unique activities, from wine tasting and food tours to hiking, mountain biking and other outdoor adventures. See the scenic cliffs of Big Sur, ride a bike through Napa Valley, CA, soak in the hot springs surrounded by wilderness, and explore the Monterey Peninsula with its beautiful views and a diverse choice of activities. Surrounded by acres of undisturbed wilderness on California's scenic coast, Costanoa is an eco adventure resort that encourages guests to explore the extraordinary beauty of this pristine and protected region. Accommodations range from guestrooms in the main lodge and log cabins to distinctive tent bungalows. All rooms are splendidly done up with modern décor and homey furnishings. Lodge rooms and cabins enjoy private bathrooms, while the tent bungalows enjoy three accommodating comfort stations featuring restrooms, indoor hot showers, a 24-hour dry sauna and an outdoor fireplace. Costanoa’s Cascade Bar & Grill serves fresh California coastal cuisine made from locally sourced, organic ingredients in a warm and welcoming setting. The menu is updated on a seasonal basis and it is advisable to reserve a table on weekends due to the popularity of the restaurant. Countless outdoor activities and adventures await guests at Costanoa. There are over 30,000 acres of hiking trailers that can be explored on foot, bike, or horseback, and four immaculate state parks full of wildlife will definitely attract sightseers and adventurers alike. Be sure to check out the country’s largest Elephant Seal rookery at Año Nuevo and the majestic redwoods of Big Basin State Park. Cabins start at $86 per night. Eden Vale Inn is all about romance. Less than an hour from Sacramento, snuggled on ten acres of spectacular gardens with a tranquil pond, in the middle of Sierra Foothills wine region, this upscale B&B is designed to exceed your expectations. All seven spacious rooms are completely private, with your own entrance to the garden, outdoor secluded hot tub, gas fireplace, luxury furniture, and modern amenities such as HDTV's, and DVD/Blu-ray players. 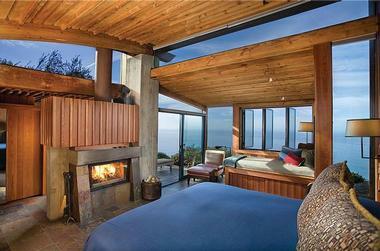 Post Ranch Inn is a spectacular getaway on the coastal cliffs of Big Sur. Guest rooms have stunning views, and overlook either the ocean or the mountains through large windows. The beds are fitted with comfortable linens, and guests will appreciate the coffee and tea, private baths, and free Wi-Fi. The spa offers several types of massages, facials, jade stone, crystal, and gemstone therapy, body polish, body exfoliation and body wraps. Carmel Valley Ranch in Carmel is a relaxing weekend getaway with nine different types of suites with a private bath, a separate shower and tub, a private deck, a fireplace, a 42-inch TV, and complimentary Wi-Fi. There is a seemingly endless list of things to do on the 500 acre property, including garden tours, golf, tennis, yoga and basketball. Luxurious, elegant, and stylish, The Flamingo Resort and Spa combines modern facilities, deluxe amenities, and attentive service with a laid-back, retro vibe to create a relaxing country retreat. This historic Santa Rosa landmark is conveniently situated in the heart of the wine country, offering an array of things to see and do, from world-class shopping to fine dining. Handsomely styled rooms feature designer décor in subtle tones, along with king-sized beds, spacious living areas and private, en-suite bathrooms with baths and showers. State-of-the-art technology in the form of flat screen televisions, data portals, and speakerphones can be found in every room, and pet-friendly rooms can be arranged. 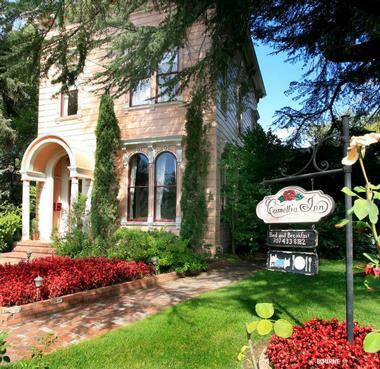 The Gosby House Inn in Pacific Grove on the Monterey Peninsula has an elegant Victorian charm that guests will notice and admire as soon as they arrive. 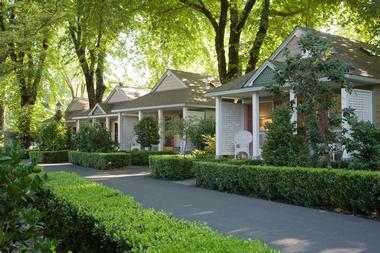 There are twenty-two guest rooms at the Inn, each with its own individual flair. Most of the rooms have fireplaces, flat screen TVs, a jetted spa tub, and a private bath. Getting close to nature does not necessarily mean roughing it. 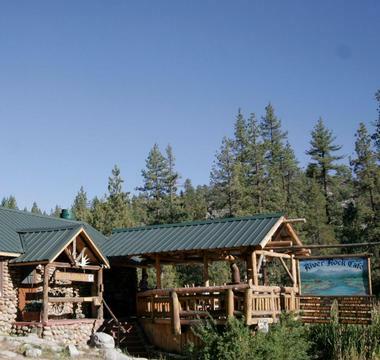 You can be in the middle of the majestic San Bernardino National Forest and still enjoy all the comforts of home in the charming, rustic Idyllwild Bunkhouse, an 18-room 'Boutique Motel', located in the small mountain town of Idyllwild, California. The Brannan Cottage Inn is an award-winning luxury inn in Napa Valley that seamlessly blends its colorful past and modern role of an intimate, cozy place for a romantic getaway. 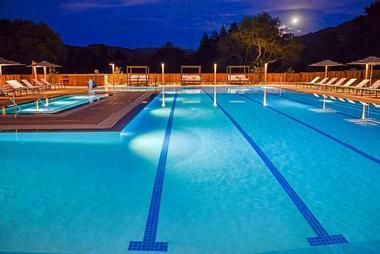 It started its life in 1862 as one of the Hot Springs Resorts built by Samuel Brannan, the founder of Calistoga. 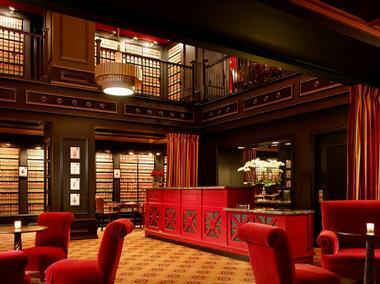 Built in 1927 and designed by California’s famous architect George Sellon, The Citizen Hotel in Sacramento started its life as the headquarters for the Cal State Life Insurance. Meticulous restauration brought the beautiful Sacramento building to the 21st century but retained its elegance and character with soaring ceilings, marble panels, and a grand center staircase. All 198 rooms and suites are luxuriously appointed and full of modern amenities such as iPod docks, flat-screen TVs, minibars and Keurig coffeemakers. 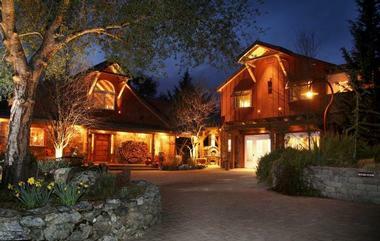 It is not difficult to find romance in the charming little town of Calistoga, in the heart of Napa Valley wine country. Famous for its hot springs, it has been a tourist destination for more than a century. Cottage Grove Inn kept the romance of the old times but added modern amenities and created 16 private, spacious cottages that offer world class luxury surrounded by lush greenery of its beautiful shady garden. Each cottage has a fireplace surrounded with overstuffed armchairs, luxury oversized Jacuzzi, private porch, soaring ceilings with skylights and unique charm that comes from combing new and old and great taste and style. Guests are treated with a gourmet buffet breakfast with freshly baked pastries, served on the patio surrounded by profusion of seasonal flowers, or in the privacy of your own porch. Visiting Fortuna in California’s Humboldt County makes you wonder about the fortune of people who live there, surrounded by so much natural beauty. Magnificent towering redwoods, six roaring rivers, endless rugged ocean coast and fertile valley full of charming historic towns, Fortuna is where you should start your exploration of this beautiful part of the country, and the Redwood Riverwalk Hotel should be your home base. Home is the right word, since this hotel offers luxury comforts of a world-class establishment with the feel and vibe of a warm, welcoming home. Magnificent murals depict the surrounding awesome nature, the history of the area and the life of the Native American Weott tribe. All rooms and suites are beautifully decorated and appointed, with great linens, modern baths, air-conditioning, and TVs. Enjoy the hotel’s excellent breakfast at the Cantina, go for a swim in the large swimming pool, and then head out and take in some of the most beautiful scenery nature put together in one place. High up on the cliff overlooking the ocean and surrounded by enchanting gardens, Monarch Cove Inn is your own little corner of heaven. 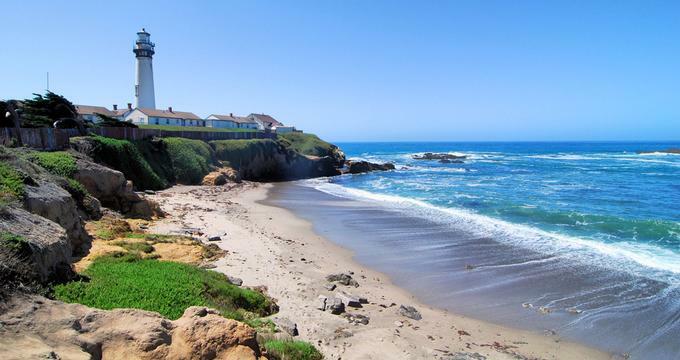 With unforgettable views of the romantic Monterey Bay, this beautifully restored Victorian mansion built in 1895 offers world-class luxury accommodation just a few steps from the charming Capitola Village. The exquisite Camellia Inn greets you with the profusion of blooming camellias, no less than 50 different kinds of them. Snuggled in charming Healdsburg in the heart of Sonoma County, where the weather is always beautiful, wines are superb and food is fabulous, Camellia Inn will make sure that your visit is memorable. Strolling along the Main Street in the historic charming Mendocino Village, you will notice a quaint blue house that is today Alegria Inn. When Alf Nelson built it in 1861 for his family, he could not possibly imagine that one day the house will be home to Alegria Inn, a place where people come from all over the world to be away from it all, secluded but still steps from everything. 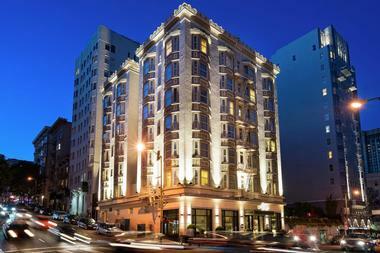 Inn on Randolph is a modern, luxury boutique inn that fully respects its 19th century origins. 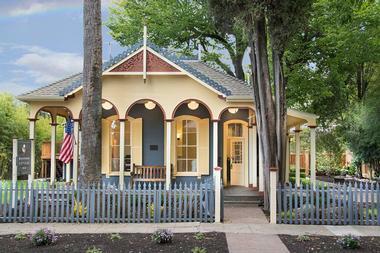 Built in 1860 in Napa for Hannah Moore and her family, this beautiful Victorian building served as a hospital and maternity ward for many years. 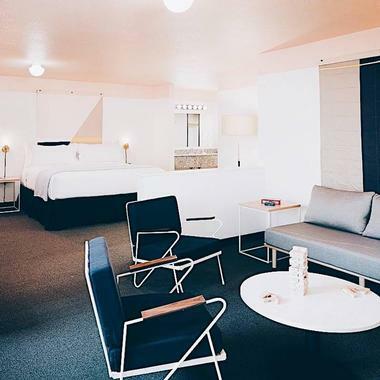 What were once maternity rooms are today luxury guest rooms full of modern amenities, offering guests a perfect blend of privacy, luxury, and modern comfort. Mono Hot Springs is provides outdoor enthusiasts and adventure-lovers with a variety of exciting things to see and do. Cozy resort cabins, natural hot springs, crystal alpine lakes, and breathtaking natural landscapes are alluring highlights of this resort, and whether you are looking for a quiet, relaxing holiday or an adventure-packed break, Mono Hot Springs has something for everyone. Historic stone cabins feature cozy furnishings in a mountain lodge style, with cozy fireplaces, ample living space, and private bathrooms. 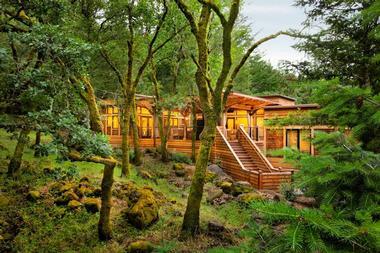 The resort promises guests a true ‘Wilderness Experience,’meaning that cabins do not have televisions or telephones; however, there is Wi-Fi available for computer use. Guests can dine at the River Rock Café, located in the main lodge, or cook up something for themselves using one of the outdoor grills and dine under the stars. Indulge in a pampering massage, relax in the hot mineral springs, hike or horseback ride one of the many trails in and around the resort, or partake in fishing, boating, or kayaking on one of the alpine lakes in the area. Cabins start at $85 per night. Once home to courageous coast guards who braved the sea to rescue those in trouble, Coast Guard House is a piece of maritime history in Point Arena. 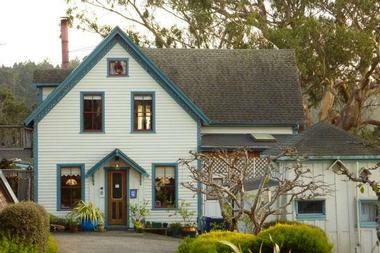 After standing guard proudly high above the Mendocino Coast since 1901, this beautiful Cape Cod building is now a romantic, secluded bed and breakfast, offering sanctuary to those who are searching for peace and escape from the stress of everyday life. The lovely inn’s comfortable, spacious rooms are beautifully decorated with fireplaces for those cool, blustery nights, and all modern amenities. There are also two separate private cottages that offer even more privacy, fireplaces and oversized whirlpool tubs big enough for two. Instead of searching for troubled sailors to rescue, guests can watch humpback whales, sea lions, and spectacular sunsets. Strolling along the beach, kayaking, or sharing a bottle of wine in the inn’s garden are further options. Starting your day with a champagne breakfast under the 100-years old wisteria is the right way to romance the love of your life. Shady Oaks Country Inn knows about romance. This lovely country inn, built in 1880s, was one of the first original Napa Valley wineries, and the inn retained many charming touches of the original rustic space. Guests looking for a room with a view will be in heaven here. 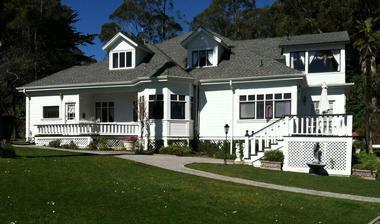 The Horizon Inn offers beautiful views of both Carmel Bay and the Santa Lucia mountains. 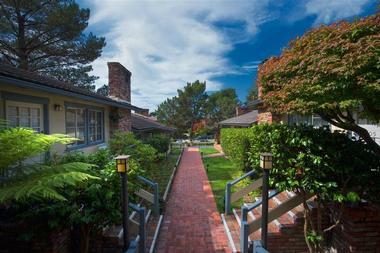 Location continues to be a theme as this inn is located conveniently to both the beach and the village of Carmel. Calistoga Ranch in Napa Valley is set on 175 relaxing and serene acres, offering an unforgettable setting for a romantic getaway. The resort has fifty rooms decorated in charming rustic and natural themes with a touch of elegance. From polished wood floors to floor-to-ceiling windows, guests will find plenty of comfort. Each room has a fireplace, Italian linens, down duvets, a private outdoor shower garden, complimentary Wi-Fi, a TV, and a mini-bar. Guests can treat themselves at the spa, which offers warm water therapy, outdoor treatments, programs and classes, mineral pools, a yoga deck, and massages. Guests have access to a heated swimming pool, sundecks, a fitness facility, bocce ball courts, scenic hiking trails, a private lake and stream, and the lodge boutique. 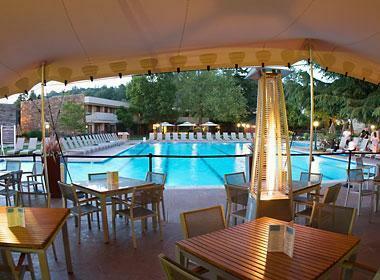 Dining options are offered in the Lakeside dining room, on the terrace, in the lounge, and by the pool. Gourmet picnic baskets are available for day trips. Rates start at $950 per night. 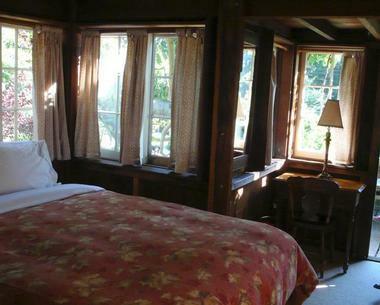 Deetjen's Big Sur Inn is a romantic and secluded escape whose allure will enchant visitors. This rustic-style inn offers twenty rooms, most of which have a private bath and beautiful views. The rooms have antique furniture full of character, soft linens, and plenty of charm, ensuring that guests will feel perfectly at home during their stay. Take a walk through the gardens or follow the hiking trails on the property. The redwoods that surround the inn create a pleasant ambience that allows visitors to enjoy and relax during their getaway. Fine dining is offered in one of four rooms every evening. The menu includes locally grown and organic foods, as well as select wines from the California vineyards. The Deetjens Restaurant also serves breakfast each morning, including homemade granola, eggs benedict, and smoked salmon bagels.